Representing their associations on The Military Coalition (TMC) are (from front row, left to right): Col. Phil Odom, USAF (Ret), MOAA; TMC Cochair Col. Steve Strobridge, USAF (Ret), MOAA; Col. Herb Rosenbleeth, USA (Ret), JWV; TMC Cochair Master Sgt. Morgan Brown, USAF (Ret), AFSA; CWO2 Randy Reid, USCG (Ret), CPOA; Donna Eldridge, GSW; Chief Master Sgt. Robert Frank, USAF (Ret), AFSA; Andrea Peterson, NGAUS; Col. Kenneth Hopper, USMC (Ret), MCRA; Boatswain’s Mate Senior Chief Petty Officer Jon Ostrowski, USCG (Ret), NCOA; Deirdre Holleman, TREA; Lt. Col. Bob Feidler, USAR (Ret), ROA; Robert Puskar, MOPH; Joyce Raezer, NMFA; Col. Rosalyn Knapp, USAF (Ret), AFWOA; Master Chief Petty Officer Tom Snee, USN (Ret), FRA; Master Chief Petty Officer Steve Sandy, USN (Ret), NERA; Col. Jim Currie, USPHS (Ret), COA; Capt. Gregory Caiazzo, USN (Ret), MCA; Bill Rausch, IAVA; CW4 Jack Du Teil, USA (Ret), USAWOA; CWO Carol Setteducato, USCG (Ret), CWOA; Lt. Col. John Gifford, USA (Ret), AUSA; Diane Zumatto, AMVETS; Gen. Larry Spencer, USAF (Ret), AFA; Rear Adm. Garry Hall, USN (Ret), AUSN; Bernie Edelman, VVA; Ray Kelley, VFW; John Kovalcik, MCL; Mike Plumer, NAUS; Bryan Birch, EANGUS; and Vice Adm. Mike Cowan, USN (Ret), AMSUS. The Military Coalition (TMC) members join forces to speak as one on Capitol Hill. 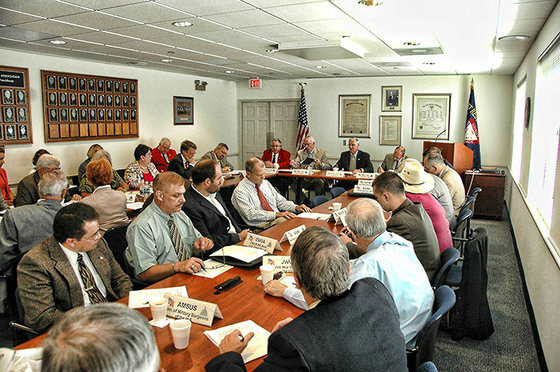 The Military Coalition (TMC), of which MOAA is a founding member, comprises more than 30 military and veterans’ organizations that have yoked their individual membership bases, offering great strength in numbers. Such strength has yielded key victories in the fight to preserve and enhance your earned benefits. n As an MOAA member, you already know you have a powerful ally in the fight to preserve your earned military benefits. But did you know that since 1985, you’ve had even more than MOAA in your corner? That’s when MOAA became a founding member of TMC, a group of military, veterans’, and uniformed services organizations that banded together to pursue common goals. TMC advocacy has contributed to significant wins for the military community, most recently the Post-9/11 GI Bill, which took effect Aug. 1. This education assistance plan has attractive benefits that the Montgomery GI Bill lacks, such as covering all in-state college tuition and offering a book stipend, a living allowance, and transferability privileges. To gain an appreciation of how doggedly the coalition pursued these victories, check in with Col. Bob Norton, USA-Ret., a deputy director of MOAA’s Government Relations Department. “TMC established a veterans’ committee in 1998,” says Norton, who has served as this committee’s cochair since its inception. “From its beginning, the committee began advocating for a better GI Bill to match the benefit with the rising cost of education. TMC became involved in the specific Post-9/11 GI Bill as soon as Sen. Jim Webb (D-Va.) introduced the first version of his bill, S. 22, in January 2007,” Norton says. Norton’s experience with the GI Bill is hard to match. When he was still on active duty he worked implementation of the Reserve Montgomery GI Bill. His knowledge base goes back at least 20 years. And his colleagues both at MOAA and within TMC likewise bring their own breadth and depth of wisdom and experience. The outcome of the Post-9/11 GI Bill is great indeed. With college education costs remaining high despite an economic downturn, the new bill’s provisions could be key to military families’ ability to attend college. Being able to transfer the benefits equally to his two sons, Cody, a high school sophomore, and Jacob, a sixth-grader, made applying for Post-9/11 Bill eligibility a no-brainer for Col. Eric Chase, USMC, a member of MOAA’s Active Duty, National Guard, and Reserve Advisory Committee. A dawning realization of the projected costs of college prompted him to take a close look at the new bill. Working in tandem to reach shared goals on behalf of America’s servicemembers is TMC’s hallmark, and it’s how the consortium began. After first banding together in the mid-1980s to fight the Gramm-Rudman-Hollings deficit reduction law, the coalition formalized in 1986. 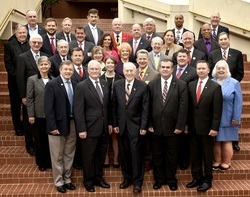 Each member organization has at least one representative assigned to one of eight legislative standing committees: Guard and Reserve; health care; military construction/morale, welfare and recreation/exchanges; military personnel, compensation, and commissaries; retired affairs; survivor programs; taxes and social security; and veterans. Temporary committees address issues that fall outside the purview of the standing committees. Each of these committees reviews, debates, and recommends to the “body of the whole” issues for TMC to champion, explains Norton. Goals are proposed each fall and ratified in December before the start of the next session or next Congress. Each member organization’s own goals are not obviated, and a member group can elect to have its name removed from specific correspondence or testimony. Generally, the majority vote rules, but if five or more members oppose a coalition action or position, it’s tabled. MOAA handles most of the administrative support and communication of the coalition, Norton says. One officer organization and one NCO organization cochair the TMC; currently, elected cochairs are MOAA Direcor of Government Relations Col. Steve Strobridge, USAF-Ret., and Fleet Reserve Association National Executive Director Master Chief Joe Barnes, USN-Ret. Clearly, TMC’s mission remains as relevant now as ever. --Donna Budjenska is a former member of MOAA’s editorial staff and an active duty Army spouse. She contributes to the Faces of MOAA column each month. 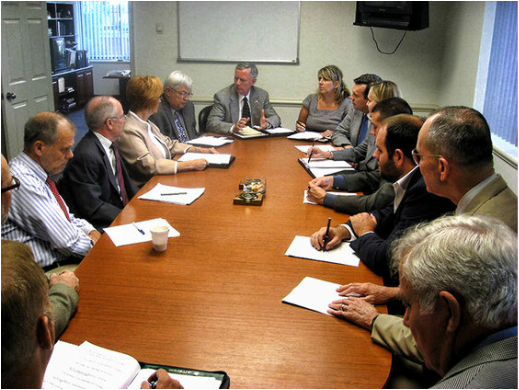 TMC has eight committees that meet once a month. TMC as a whole also meets on a monthly basis to discuss matters affecting military personnel.